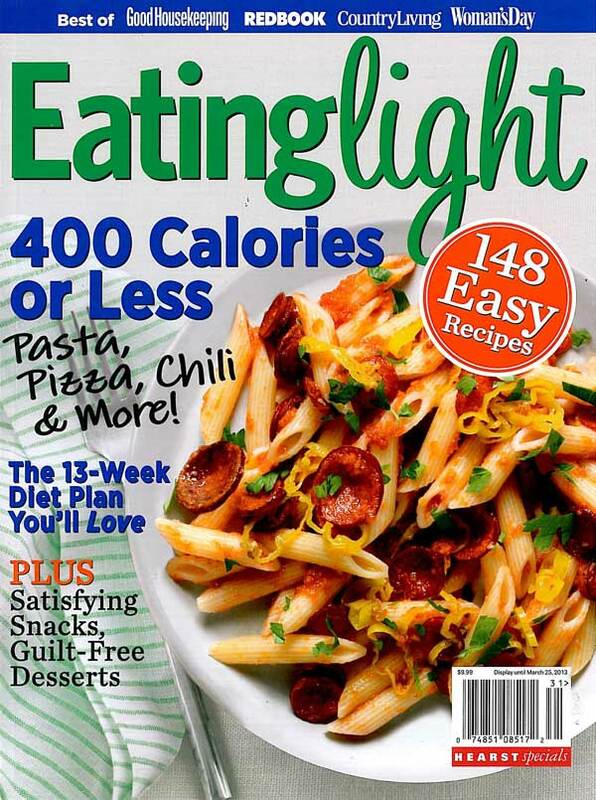 Today’s recipe is from the winter edition of Eating Light – 400 Calories or Less. It’s a chocolate mocha mousse with 208 calories and 11 grams of protein per serving. Before I jump to the recipe, I should mention that Eating Light is a special interest Hearst publication and the recipes within it come from some of my favorite sources including Woman’s Day, Redbook, Country Living and Good Housekeeping. I posted the mousse because this is a dessert blog, but when I started reading the bookazine, what really stood out were the entrees. They’re practical yet interesting, the ingredient lists are fairly short, and there’s a full color photo of each recipe. I’ve got my eye on the Artichoke and Spinach Casserole, a Ziti recipe that incorporates herbed ricotta for protein, a slow cooker recipe for Chicken Marbella and a few others that are under 400 calorie versions of old favorites with little twists. If this sounds like the kind of publication you’d use, look for Eating Light on Newsstands or grab the digital version on Zinio.com or Nook (though check and make sure you’re getting the 2013 issue). Now onto the mousse! I was a little skeptical because the recipe calls for silken extra-firm tofu, Kahlua, cocoa powder, agave, and coffee. While I like tofu, I’ve mainly used it in mousse and pie recipes that also call for plenty of melted chocolate. Combining tofu with lean ingredients such as Kahlua, agave and cocoa powder led me to suspect it wouldn’t be as rich and satisfying, but I went ahead with it. The mousse was really very good! I could definitely taste the tofu, but I like tofu so that wasn’t a big deal. My mousse appeared to be a little softer than the mousse in Eating Light’s photo, but then I realized that the brand of silken tofu I bought did not say “extra-firm”. Not that it was a big issue, but for a thicker mousse, look for tofu that says “extra-firm” and most importantly, “silken”. The real test was whether or not Todd and Fuzz would like the mousse. Fuzz took one bite and declared the tofu overpowering, while Todd (who is indifferent towards tofu and will take it or leave it) loved it and thought the flavors all went well together. He was mostly impressed with the flavor of Kahlua. Here’s the recipe. Let me know what you think! I’m also kind of curious as to whether the brand of tofu used will affect the flavor. I normally use Mori-Nu silken, but for this batch I used a brand called Azumaya. In saucepan on low, heat 3 Tbsp. Kahlua. Add 4 tsp. instant-coffee granules; stir to dissolve. In food processor, combine 36 oz. 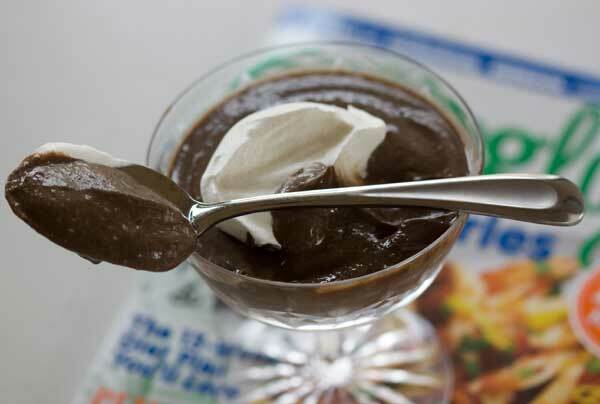 drained extra-firm silken tofu, 3/4 cup agave nectar, 1/4 cup unsweetened cocoa powder, 4 tsp. vanilla extract, 1 tsp. ground cinnamon (if using), and coffee mixture. Process 6 minutes or until smooth. Spoon mousse into bowls; refrigerate 30 minutes. Garnish with whipped cream, raspberries, and mint leaves, if desired. Cook time refers to the chill time. For the tofu, make sure you use the kind that says "silken". Tofu chocolate kahlua mousse! We are kind of dieting at my house. I’ll bet I could fool my husband with this one!! Its been a while since I used tofu for mousse or pie, but have a great vegan tofu pumpkin pie where you’d never guess there was tofu in it. I’ll have to give this a try sometime, but i might “rich” it up with some melted chocolate chips. 🙂 I do usually get the extra firm version.